NAIROBI, Jan 10 2013 (IPS) - With less than two months before Kenyans head to the polls for what is shaping up to be the most competitive and polarised general election in the country’s history, many fear that this East African country of over 40 million has not seen the last of electoral violence. This is in spite of the fact that two top politicians – Uhuru Kenyatta and William Ruto – still await their fate at the International Criminal Court (ICC) on charges of crimes against humanity committed during and after the 2007-2008 election. Post-election violence, alleged to have been instigated and encouraged by these two politicians, left over a thousand people dead, over 3,000 injured and hundreds of thousands displaced. “Still, unscrupulous politicians continue to spread their tentacles through Kenya’s sprawling slums. Here (in the slums), for a dollar or two, even less, people will threaten, maim or even kill those expressing opposing political positions,” Peter Muga, a political analyst in Nairobi, told IPS. Unemployment and poverty have left millions of voters in various slums vulnerable to the lure of politicians who have no qualms about taking extreme measures to silence their opponents. “But since these politicians don’t have the guts to face their opponents at the ballot, they pay youth in the slums to do their dirty work,” Muga added. In an effort to avoid the disastrous impacts of election-related bribery and violence that fuelled the 2007-2008 crisis, residents of the notorious Mathare slum – the second largest in Nairobi and home to some 500,000 people – have begun a movement dubbed ‘Tia Rwabe Zi’ (Say No to Ksh 200). “Politicians give us ksh 200 (about two dollars) to fight those who do not support them,” Julia Njoki, a founding member of Tia Rwabe Zi, told IPS. “Often, contending candidates are from different tribes. This animosity quickly becomes tribal. As we speak, Mathare has already been zoned, there are some tribes that cannot live or vie for political positions in certain areas,” she added. According to Njoki, this movement was born out of the death and destruction witnessed during the 2007-2008 post-election crisis, the brunt of which was borne by urban slum dwellers. “In this movement we are saying no to voter bribery. Most of us are youth, both male and female, and women. We have also been reaching out to others in various slums such as Kibera,” she said, referring to the massive Nairobi slum, one of the largest informal settlements in Africa. But the campaign has taken on a gargantuan task and will not have an easy victory. Even memories of the bloody chapter of 2007-2008 will not deter desperate and impoverished Kenyan citizens from doing what they can to ease the burden of their abject living conditions. When residents of the expansive Kibera slum invented the ‘flying toilets’, many Kenyans with decent homes and proper toilets found humour in it. But for the slum dwellers themselves, being forced to defecate in plastic bags and send the contents flying through the air for lack of proper sanitation and waste disposal is no laughing matter. Neither is having to urinate in plastic containers. While various stakeholders have responded to the plight of slum dwellers and constructed toilets, not much has changed. When night falls, communal toilets become a no-go zone due to a lack of security. As a result, many residents wake up to find faecal matter in plastic bags on their doorsteps, left behind by neighbours under the cover of darkness. “People still use flying toilets because using communal toilets are not free. 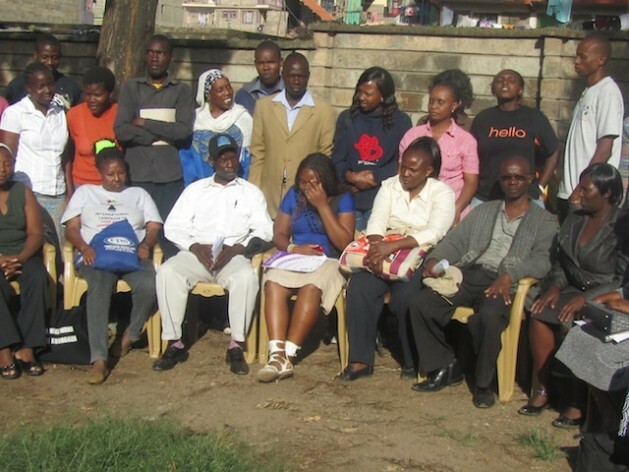 The money goes into maintenance,” Veronica Wamaitha, a resident of Kibera, told IPS. On a good day, people living in the slum earn about two to three dollars, but often go an entire week without earning a single coin. Against this backdrop of people living neck deep in squalid conditions, politicians have found answers to their problems. “Kenya’s population is largely divided into two, those living under the poverty line and the middle class. The middle class are fairly educated and they understand the concept of self dependency – not so with the poor,” Ken Ochiel, a political analyst in Nairobi, told IPS. He said that those living in poverty still believe that political leaders hold the key to a better future. “This is the disease that is eating away at our society. Leaders who have more money and can bribe voters are easily elected. But in truth, they don’t improve the living standards of the poor who vote for them in droves,” explained Vesca Kangongo, who is running for the seat of governor in the Rift Valley Region. Karua has also claimed that politicians are behind the recent waves of violence and murder in the Mathare slums, which stir memories of the 2007-2008 crisis in which Mathare, Kibera and many other major urban slums were transformed into dens of death and destruction as tribes rose against each other. “In every general election, politicians send their foot soldiers to the slums, since the middle class will not accept two dollars to intimidate, threaten and even to kill,” according to Muga, while the poor are much more susceptible to bribery. Still, the Tia Rwabe Zi campaigners are determined to make a difference this year. The group holds regular meetings and speaks strongly against violence and idleness “We encourage each other to take odd jobs and even notify each other whenever there is a job opening. People must keep busy to stay out of trouble,” Njoki explained. While acknowledging that expecting people to turn down bribes in the face of poverty and hunger is a tough call – and that change will not come overnight – she stressed that members of the campaign are convinced that their efforts are a step in the right direction. I totally agree I do not see the problem with 200 though. Just take it and buy unga. You will be on the ballot booth alone and no one will see whom you vote for. So kula rwabe lakini usiuze kula will be my take. I totally understand what the movement is trying to do but it won’t work in slums. Before it works 60% of slum dwellers must be provided with jobs regardless of how odd the jobs are. The power is in the hand of the majority and ignoring the slum dwellers could cost a politician heavily.